With the Royal Wedding coming up everyone’s attention is on everything English. My mother told me how my great grandmother each day served 4 o’clock tea. Having been a school teacher on the prairie, it impressed me that she incorporated this tradition into what was an unconventional life. This 5 piece Beehive Tea Set by Towle® from Mikasa carries on that tradition with a definite flare. It’s style fits any decor and would definitely make a statement. Nickel-plated and whimsical, this is an heirloom in the making, and edit is bargain priced at $49.95, mrsp. $255.00. It– includes a honey pot with spoon–how cute is that! A perfect gift for a springtime or summer wedding that will make any couple feel like royalty on that special day! Free Shipping on purchases of $99 or more. Wednesday Steal: Zip It Up! Have you noticed the latest fad in fashion is the unhidden zipper? Pre-hippie era, all the dresses either were fitted with a back zipper and/or buttons and the familiar question to your significant other was: “Can you zip me up?” Zippers were also on the side of skirts, front flap of pants, and even on some blouses. However, zippers were all hidden, sh- h-h big secret! More contemporary designs have seen zippers galore in handbags, shoes, and some jewelry. Now they have come out of hiding and are reappearing and hotter than before. You can find them on motorcycle jackets and sweaters, dresses and tops, out-in-the-open and part of the design. Popular first with celebs, now we can all wear them! While you’re there view their other deals including electronics such as 3-1 Digital Photo Converter, reg.$169.99, today only $39.99, and a Wii Gaming Storage Tower, reg.$140.00, today only $34.99. Ship to store for free shipping, or on orders of $69 or more ship free to home, promo code: FRESHDAY. …And the CBS Early Show with their takes on sales after the holidays and the January sales coming up. Today, Rebecca Jarvis speaks with AOL Consumer Advisor Regina Lewis about the best deals for January 2011. Men’s Suits. Retailers are starting to do their seasonal changeover from Winter to Spring, and are reducing the price on current stock. Check with Jos. A. Banks for some real deals of up to 70% off! 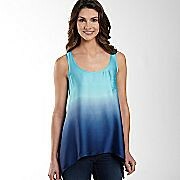 Additionally, they have a Deal Of The Day, with up to 75% off retail. Purchases of $175 online ship free! Carpeting. The big rush is over for decorating your house for the holidays, so if you have an flooring needs, now is the time to look for the deals. Often a slow time for carpet sales, you may be able not only to score some deals on carpet, but to negotiate installation costs as well. Bicycles. Remember the old song, you can’t roller skate in a buffalo field, but you can try if you have a mind to. Now is the time to upgrade your pedal power since this is a seasonal slowdown for many shops and chains for bicycles. Unless, it is a pro-racer model, you might want to forego those repairs, and buy a new one. Amazon and REI®. White Sale. For over 100 years, sales on white goods like linens, sheets, etc., is synonymous with January and so it is again this year. At Macys and Sears Outlet Sale expect savings up to 70% off, on all kinds of items including appliances, cameras & electronics, fitness machines, and mattresses. Christmas Eve and Online Christmas Clearance Begins! Not had enough of shopping? Maybe no, but then again you may have had enough of shopping crowds. Don’t dismay, online Christmas Clearance has begun. QVC and other retailers have already launched their post-holiday clearance event and they have coupled it with FREE Shipping and Handling. If you need a breather from wrapping, or preparing holiday fare, you can pick-up a few presents for those you missed, self-gifts, or like a true bargain hunter put a “find” away for next year. Many items are markdown 30%-50%. Overstock.com is having their Holiday Liquidation Sale, and today is the last day you can get free shipping, really a good deal for furniture and home decorating items; however, their shipping rates are so reasonable, any day is good. Up to 48% off selected items. Filler Up & Get Free Super Savings On Shipping! 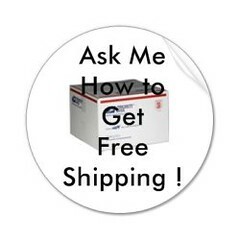 The only thing that peeves us shopping online is paying shipping and handling–am I right? Sometimes the shipping is more than the price of your purchase. And how many times do you miss qualifying for free shipping by a buck or two, or even less? Oh, so close, but no cigar! Well, for one online giant, this problem has been solved or somewhat mitigated. A new search engine Filler Item will tell you how much you are short for qualifying for super saving free shipping from Amazon. Put the amount you need to spend to get to $25 in the box, and then check the boxes for the product category you’d be interested in. It will search for items to reach the amount you need and list only those that will qualify for the super saver free shipping. Rather than paying that hefty shipping fee that you can’t see or touch, find a little item with your change for a stocking stuffer for birthdays, special events, holidays–or add it to your package wrapping –the recipient will be totally stoked! Don’t worry about remembering this tip, Markdown Mom has put it on her “SHOPPING” page, so you just have to click it when you make your purchase. Into this Wednesday Steal! Pearls are still in this season, so why not get real freshwater pearls below the cost of simulated ones! 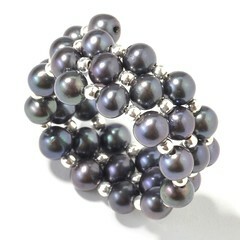 At ShopNBC get this sterling silver black freshwater pearl wrap ring in three sizes of small, medium and large for $9.74, reg. $25.20, a 51% savings! Free Shipping on this and other clearance today! Kitschy and perfect for this fashion season’s emphasis on accessories!